Last season, I participated in the Pinterest Challenge hosted by YHL & Bower Power (this time includes Ten June & Centsational Girl too). It's so fun to see everyone's ideas and inspiration come to life, so I decided I'd give it another go. Last time I linked up my It's A Cinch bag... so this time I decided I'd do a smaller scale project. 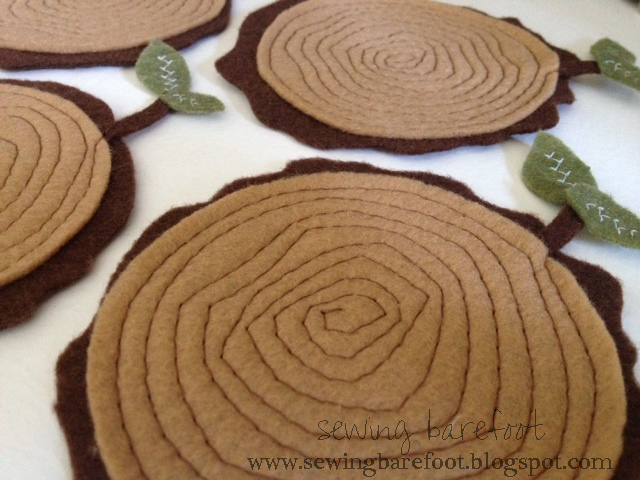 Start by pinning the "outer tree stump" template to your darkest piece of felt (this will be your "bark"). You will need 1 outer tree stump per coaster. Repeat this step with the lighter felt and "inner wood stump" template. 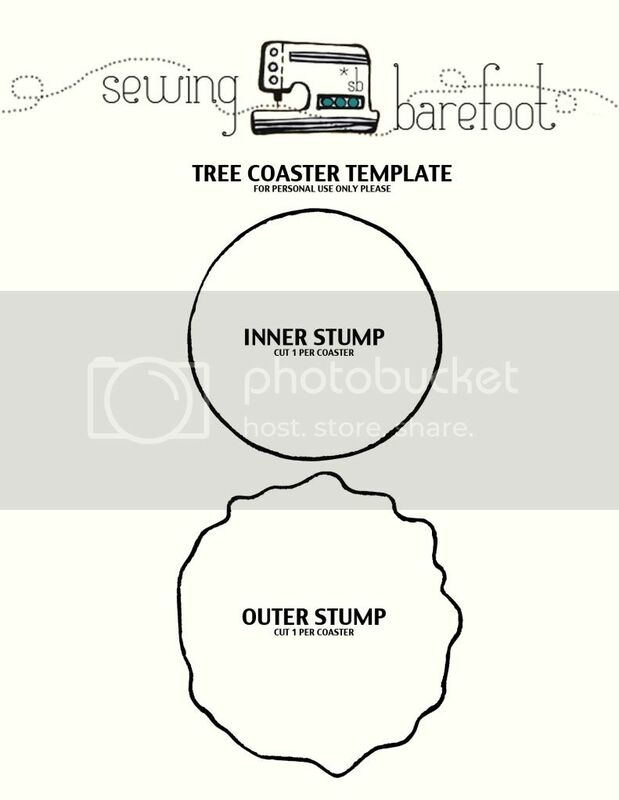 You will need 1 inner tree stump per coaster. 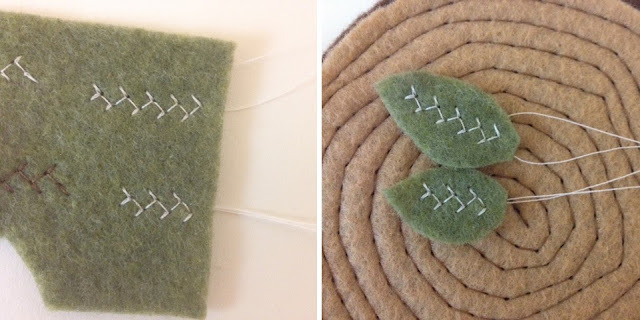 Cut a small curved piece of dark felt for your twig. 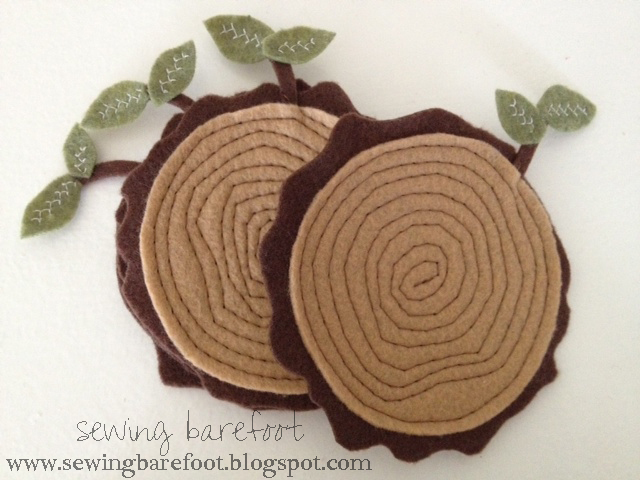 Pin together your outer stump, twig & inner stump and sew together on your sewing machine. I started with the outer edge of the wood grain and circled around to the middle (making sure to capture my twig so it would be secured to the rest of the coaster). This part is fun because it doesn't have to be perfect - in fact, I tried to make some irregular lines to make the veins look more realistic. Finally, hand stitch the leaves to the twigs for the final touch. 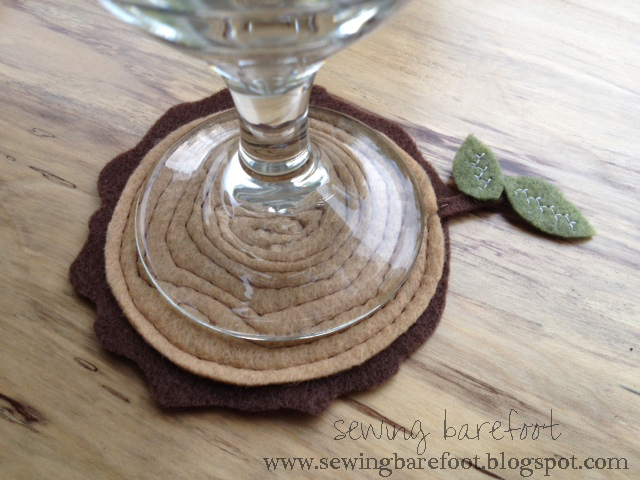 Repeat steps 3-5 on your remaining coasters... then have a drink! Maybe some mint tea? Those are the most adorable things I've ever seen! What a cute and original idea! 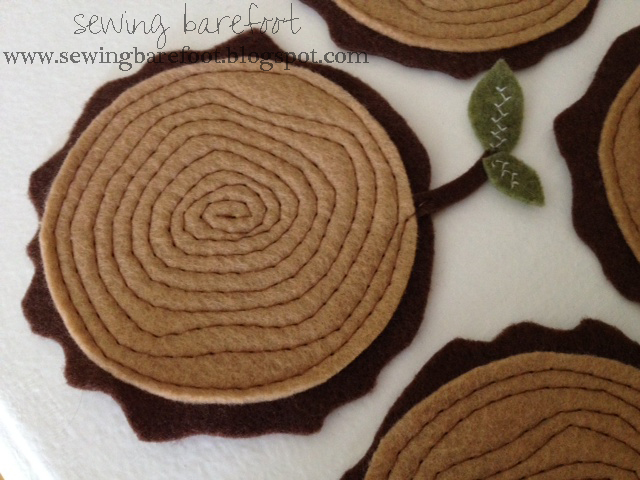 I love finding new ideas for felt because it's so easy and cheap to work with. A holiday version could be really fun for parties. Thanks ladies! 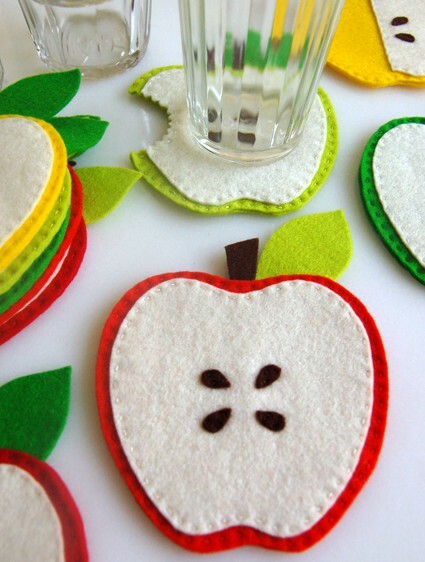 I have a few other felt/coaster ideas that I think would be cute - I might need to do a follow up post. Please let me know if you make your own... I'd love to see the finished products! Thanks for the sweet comments. What a fun idea. These could be really awesome as large placemat/chargers too. What do you think? What a great idea - they would make great chargers. Now I'll just have to find felt pieces big enough. Thanks for leaving a message! Absolutely LOVE this and it just might have to be one of my first sewing project attemps. Just saying (smile) I love these that much. Thanks so much! Good luck :) This is a good project to start with - felt is pretty easy to work with and is forgiving. Let me know how they turn out. Such a cute idea! Your coasters really turned out great! I love these! I think they turned out even cuter than your apple inspiration.